Successfully Added Cosmopolitan Quadband Dual SIM Touchscreen Phone + Accelerometer to your Shopping Cart. 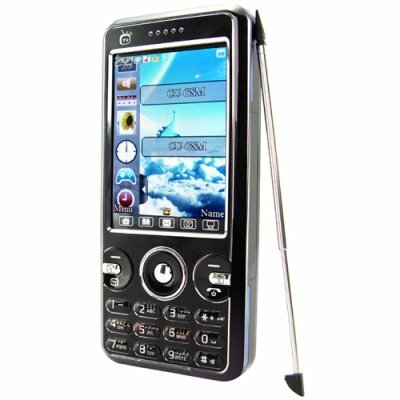 Cosmopolitan Quadband Dual SIM Touchscreen Phone with Accelerometer. This is a stylish quadband GSM unlocked cellphone with a responsive 2.6 inch touch screen ready for worldwide use. This eye-catching quadband phone has a charming slimline form factor with a fantastic feature set. Sophisticated to the core, this cell phone is presented in raven black with smooth, brushed metal edges. Fully unlocked, this refined dual SIM phone is a true globetrotter with its native quadband support (850MHz, 900MHz, 1800MHz, 1900MHz) enabling it to work on any network of your choice. Coming with two SIM card slots ready for use, you can be confident in never missing a business or personal call. Productivity and multimedia features are available straight out of the box for your convenience. Organize your work schedule efficiently, arrange your busy social life with ease or simply relax and unwind with movies, music, radio or TV - the choice is yours. Designed with maximum functionality in mind, the attractive touchscreen interface offers intuitive and user-friendly control, putting you squarely in charge of this powerful mobile phone. Cool widgets are also available from a pull-out side bar on the main screen to further enhance your experience of the smooth user interface! A responsive accelerometer motion sensor provides even more finesse: shake to change music tracks, change the wallpaper, play customized sounds, change TV channels and much more! Bluetooth wireless connectivity rounds off a generous feature set, ensuring you stay connected wherever you go, whenever you want. A blend of playful charm and practical elegance, the CVDQ-M32 would suit almost anyone. Designed for work and for play, whether at night or during the day, this cellphone would be the perfect accessory for today's cosmopolitan user. Effortlessly complementing your style, this trendy handset would also be a highly desirable gift for the one you love (or like). Available now for single piece sample of bulk stock orders. Get yours today and be ahead of the crowd. Fully unlocked quadband mobile phone for worldwide use. Easy to navigate touchscreen user interface. Good balance of features for productivity and fun. Stylish and trendy, this phone would be ideal for today's cosmopolitan user. I live in the USA, will this model mobile phone work here? Yes, this Quad band GSM mobile phone will work anywhere in the world. This phone has an accelerometer, what the heck is that? This is a built-in motion sensor that tracks when the electronic device has been tilted or swiveled. It is a feature most commonly used to change images in a photo viewer or to change tracks in an audio player. Esse aparelho é muito bom e divertido... NOTA 10! This is phone Very good. chaniavasion you're the best i bought three of these phones received them within two weeks and i have intentions of buying more very soon because every one likes it,thanks chinavasion this is great.